Click HERE to renew your SAM Membership for 2019-20.
Review the results of the SAM Needs Assessment Executive Summary 2019 and the SAM Needs Assessment Data Disaggregated by Affiliate 2019! U.S. EPA Region 8 presents Reducing Lead in Schools: A Webinar Series - Click HERE for more information and to register. See how the SAM Leaders Professional Learning Program is doing by reviewing the SAM LPLP 2018-19 Mid Year Executive Summary! RISE4MT Update 1-9-19 and MUS Rural Educator Recruitment and Retention Task Force. MT 2018 R&R Survey Results and Summary implications on future recruitment & retention efforts. See how efficient and effective our Montana administrators are by looking at the just released 2018-19 Montana District/School Leadership Staffing Report! 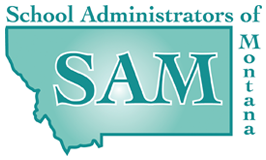 SAM Leaders Professional Learning Program 2018-19 Check out SAM's professional learning programs for Montana's School and District Leaders! Broadband for Montana Schools Program announces funding opportunities for school districts fiber/broadband connections and internal networks and WI-FI -- Broadband Back-to-School LETTER from partners (Governor, State Superintendent, Dept of Commerce and SAM) describes the opportunity for school districts. 2017-18 District/School Leadership Staffing Report Administration for Montana Schools is effective and efficient! Suicide Prevention resources are available through the work of the Montana Suicide Prevention Task Force over the past 4 years. Please check out The Montana Crisis Action Toolkit on Suicide (MT-CAST-S 2017) authored by Drs. Scott and Donna Poland with guidance from the State Suicide Prevention Morbidity Committee (website). See also the Montana Suicide Awareness & Prevention Training Act resources available to you for community planning. The Montana ESSA Plan has been approved by the US Dept of Education. See ESSA Implementation for resources and progress on implementation. RISE4Montana prepares Education Interim Committee Meeting RISE4MT Information 1-22-18. Check out the RISE4Montana 2017 Update and the RISE4MT SemiAnnual Report May 2016. The SAM Membership Renewal Drive for 2019-20 continues! Remember, district clerks/business managers must complete renewal forms for SAM members associated with districts. Individuals not associated with a district and MCASE members must complete their own renewal forms. So far, there are ???? renewed memberships for 2019-20. Click the link below to renew your membership.